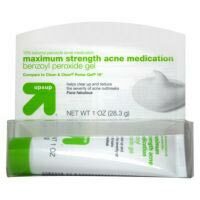 Looks as if maybe it might help acne faster bc of it's strength. But I doubt it. Family also used it, and they didn't have as many complaints as I did. It's possible it's not working for me bc i do have naturally dry skin. Excessive Peeling Drying Uncomfortable for days after. Ultimately, I would not recommend this. Keep in mind as you are reading: I do have naturally dry and sensitive skin. So it may work different for you! This product was supposed to act as a replacement for Dan's BP until it came in the mail for only a day. I used it at night for one day just bc I didn't want to stop the regimen waiting on it to come in the mail. It felt fine applying it, but in the morning, It was intense drying and not just drying but intense peeling! I had noticed that I rarely ever peeled on Dan's BP and this was something different. Keep in mind I did realize it was 10% BP and only used a little bit, and it still caused extreme peeling. It's simply not worth the pain, and actually aggravated my skin, let alone the acne. Stick to Dan's BP if you have the choice! Don't waste your money, or the annoyance! My skin still looks like crap from it, and it's been two days. I'm continuing on Dan's BP, so hopefully it's return to normal and clear up the other crazy acne. Hope this helps!